Bookings: +(34) 966 813612--902 141514. LOW AVAILABILITY - PLEASE BOOK ASAP!. The BALI HOTELS GROUP is organizing in 2018 the XVIIth edition of its fantastic International Chess Festival. 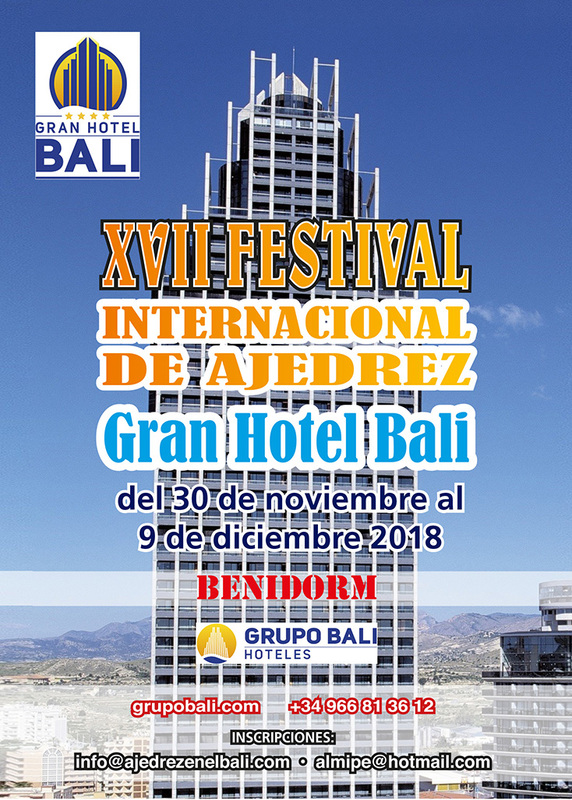 All chess fans will once again have the opportunity to take part in the XVIIth International Chess Festival "Grand Hotel Bali" to be held in Benidorm. It is well-known that this important hotels group makes a huge effort in order to maintain one more year this wonderful sports activity delighting many people who come here again and again. We know very well that it is not easy at all to organize an event like this, but the 2018 edition is here again! We are pleased to realize that this interesting Chess Festival attracts many and many chess fans coming both from Spain and from all over the world. Their participation makes it possible to carry out this Festival every year, achieving better results. 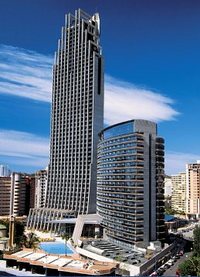 We always say that this chess event is a great attraction for many people who come here and spend a great time in the touristic city of Benidorm. 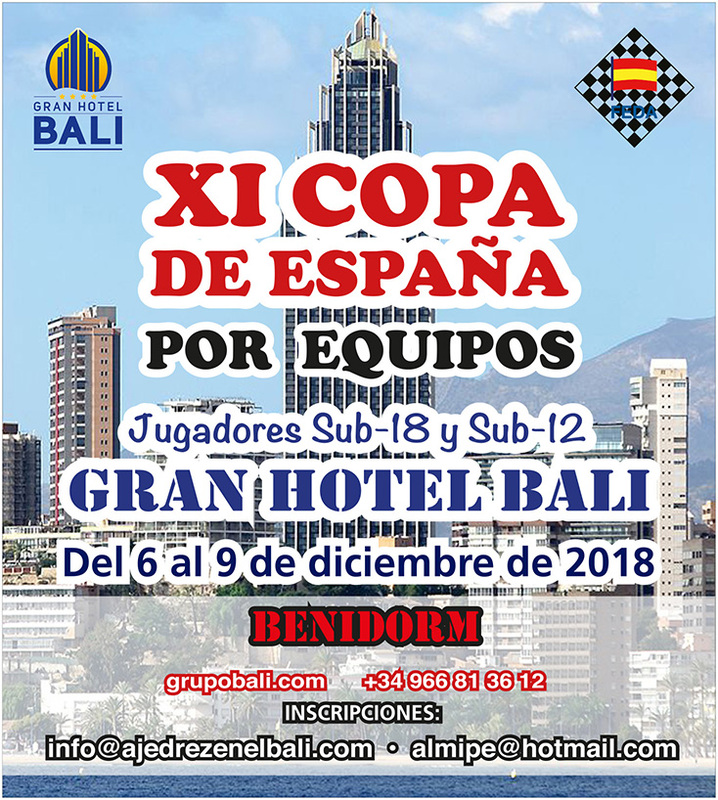 The Grand Hotel Bali will become again the venue of the XI Spanish Sub-18, Sub-12 Teams Championship, with an interesting novelty of free teams' participation in 2018. We promoted the beginning of this competition years ago and we are happy to be able to continue to organize it due to a very important support from FEDA (Federación Española de Ajedrez; Valenciana Chess Federation). We arrive at seventeen years of the BALI Festival maintaining the Amateurs A and B Tournaments, the XIVth New Generations Tournament, with attractive prizes offered by FEDA for winners in all categories, as well as wonderful Night-Time Tournaments, an innovative International Blitz-Rated Tournament, the Champions Cup of the Comunitat Valenciana, and numerous complementary activities. It is my pleasure to thank once again, as I always do it, all of you for supporting our tournaments by your participation. My special thanks are due to the BALI HOTELS GROUP as a permanent driving force of this great International Chess Festival, as well as to the National and Autonomic Federative authorities for their permanent support and collaboration. Enjoy the XVIIth edition of the International Chess Festival!